In the annals of college football, many coaches have better won-lost records than William Alexander (Bill) Curry, but none were more respected or more interested in the welfare of his players. Go as far back as Stagg, Rockne, Heisman or as recent as Dodd, Dooley or Jordan and you will find no one who preached that the human soul was worth much more than winning football games. Not a bad start for a native son who came back to his alma mater where he had captained the 1960 team and was selected to the All-America team at center. Not a bad start for a coach who insisted his players attend class and pass their work. His players had an 85 percent graduation rate. In writing about Bill Curry, three words come to mind — dignity, class and integrity. When he left Georgia Tech in 1987 and agreed to coach the University of Alabama football team, he did so only after a clear understanding with Alabama President Dr. Joab Thomas. If Curry had reason to kick the star player or any other player off the team, no matter how much pressure would be exerted by alumni, President Thomas would back him 100 percent. The agreement was sealed with a handshake. In Curry’s third season he led Alabama to the Southeastern Conference championship and its first Sugar Bowl berth since 1980. He did it by playing by the rules, and there was not the slightest sign of scandal. In his three years at Alabama, he led the Tide to a 26-10 record and three bowl appearances. Bill Curry is a renaissance man if ever there was one. When he was 10 years old, he announced to his father that he was going to marry his elementary school sweetheart, Carolyn Newton. This year they will celebrate their 40th wedding anniversary. He was an all-state football player at College Park High School. He played on four Super Bowl teams, two for Vince Lombardi at Green Bay and two for Don Shula at Baltimore. He was named twice to the All-Pro football team. He was president of the National Football League Players Association. He is a member of the state of Georgia Sports Hall of Fame. He was a member of the American Football Coaches Association Ethics Committee. He co-authored a book with George Plimpton on professional football. He served on the Board of Directors of Scottish Rite Hospital. Twice he chaired campaigns in eastern Alabama to benefit cancer patients. You might say he has done everything but play in the band — except that he did that, too. He played the baritone in the College Park High School band three years before he made the varsity football team. Today Curry is a respected football analyst for ESPN. He recently signed a new four-year contract. The Currys live during the weekdays in a Buckhead condominium; they also have a mountain home, near Murphy, N.C. “From our windows we can see three states,” Bill says. If you think the Currys have led a charmed life, think again. In the past 37 years, with his playing and coaching, they moved 31 times. Despite his success, what they endured from zealous Alabama fans was a horrible nightmare. What happened at Alabama the Currys will forgive but never forget. 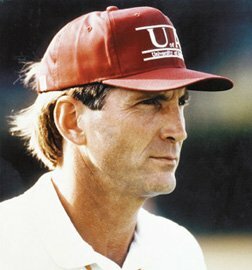 When Ray Perkins, one of Bear Bryant’s former players, gave up the head coaching job in 1987 to become coach of the Tampa Bay Buccaneers, the most likely candidates to succeed him were Bobby Bowden, Howard Schnellenberger and Danny Ford, all of whom had won NCAA national championships and had ties to Alabama or its late, legendary coach, Bear Bryant. The man President Dr. Joab Thomas picked was Bill Curry. To say that some Tide fans and Bryant disciples were less than enthusiastic about President Thomas’ choice would be an understatement. They were downright livid. Before Curry even arrived on campus, he, his wife, Carolyn, and President Thomas all received death threats. There was a backlash from some of Bryant’s former players. Once Curry and his family settled into a home, the hostility increased. Rocks and assorted missiles were thrown through his office window. The unflappable Curry took it in stride. In his first Tide football season, when his team was expected to be an also-ran, he came within one game of winning the SEC. In his second season, he took his team to the Sun Bowl. Still the harassment continued. Some members of the media called for his resignation. In his third season, Curry accomplished more than his predecessor did in four seasons. And even Bryant could not match Curry in his last three years — getting Alabama to the Sugar Bowl. Curry’s three-year record of 26-10-0 and three straight bowls was as good as that of any coach in Alabama history. After winning the SEC crown in 1989 he resigned to become the head football coach at Kentucky. He left Alabama with the same class with which he arrived. “Those rabble-rousers, those hangers-on, they are riff-raff who will turn on you in a minute.” Curry didn’t say it, Bear Bryant did.